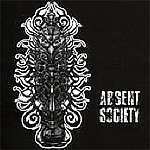 Review: "Absent Society: Absent Society" - Sea of Tranquility - The Web Destination for Progressive Music! If you pop this sucker on and listen to, oh, the first 65 seconds of opening track "Wasted Lives," you may want to reach for the "stop" button � unless you dig extreme metal sung by a guy who sounds like he can't sing. But give that song (and this self-titled, five-track EP) some time. Jason Everett's voice is actually very melodic and takes on the clean and somber tones of Opeth's Mikael �kerfeldt . Absent Society hail from the San Francisco Bay area, and its disc won't be the greatest thing you'll hear this week (or maybe even today). But it is a slam-worthy slab of aggression influenced by Mudvayne, Slayer, Pantera, Opeth and Metallica. Recorded at The Plant in Sausalito, Calif., the EP sounds a bit redundant, especially when Everett bellows. Yet through all the noise, you can actually hear the sound of a band finding its way and feeling every damned note it plays.